Used pallet racks offer savings of up to 40% for companies that require the structural stability, safety, and organizational benefits of pallet racking systems. 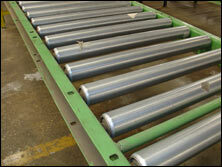 Used pallet racks are equivalent in quality and performance to new systems. 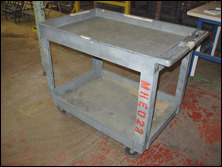 A wide range of types and styles can be obtained at significant discounts through an A&A Surplus Inc. material handling specialist. Pallet racking systems can be standard or custom built according to environment, terrain, indoor or outdoor conditions, and seismic quality of the floor or ground on which they are installed. 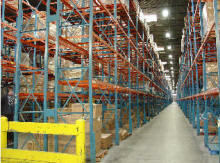 Teardrop pallet racks are the industrial standard for most pallet racking applications. They feature a boltless design that makes it easier to assemble and adjust them. The boltless design also offers the additional benefit of keeping the platform more stable and preventing buckling in the middle. A&A Surplus Inc. used teardrop pallet racks are braced with heavy channel steel and supported by tensile steel columns to provide you with the safest and most reliable platform possible. 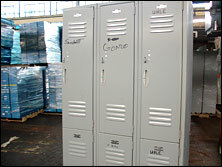 Heavy duty used pallet rack have metal shelving designed for high traffic and fork truck access. "Industrial" is a synonym for "heavy duty" and often refers to pallet racking with weight capacities of up to 48,000 pounds. 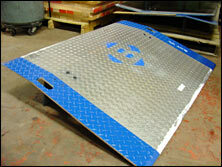 They are constructed from structural steel and designed to withstand occasional fork truck collisions. 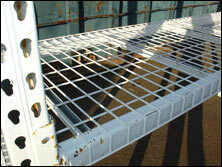 Used wire decking is the most popular type of decking installed in used pallet racks. A&A Surplus Inc. supplies all three major forms of wire decking: waterfall, reverse waterfall, and lay in decking. 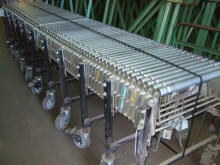 Wire decks offer the advantage of allowing dust and debris to fall through to the floor. Also, if the sprinkler system is triggered, the water will run through the wire rather than collecting around components. Fire codes are beginning to require this so that fire suppression systems can more effectively put out fire. Wood decks can also be obtained by special request, but are not generally recommended due to the trend to use wire for fire codes. 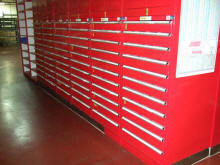 Heavy duty steel decking should be used for heavy duty industrial storage. A&A Surplus Inc. material handling specialists will help you custom build your system and coordinate the installation of your racks. 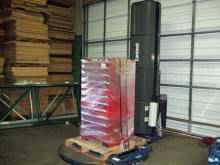 Two of our most popular system types are warehouse pallet systems and structural pallet systems. Used warehouse pallet racks are designed to function as organizational and storage starting points for operations that anticipate growth or expansion. These systems are designed for adaptation and modification as process flow increases or changes. Custom systems can be built from used pallet rack decking and structural supports that maximize your existing vertical cube and floor space, provide you with the best storage density within safety parameters, and facilitate either hand or fork truck access. Used Structural Pallet Racks are extra sturdy, more stable, and more impact resistant than standard rolled pallet rack systems. Structural upright systems are available in a variety of well known, standard styles that include, but are not limited Inca, Sturdibilt, Steel King, Frazier, Arco, and Speedrack. 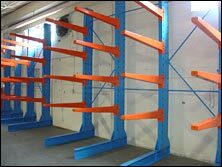 Some pallet racking systems are designed for use exclusively indoors, while others can be used outdoors in construction or shipping areas. If you are unsure which type of rack, support, style, or decking to order with your used system, call a material handling specialist with the details of your storage volume and inventory cycle and have him or her run the necessary calculations to locate the optimal system for your needs. 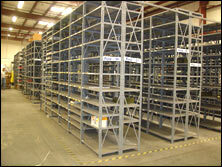 For more information on used pallet racks contact us at: 1-800-826-5326.